Effortlessly convert a Slimline II Roof Rack into an expedition style rack with this side rail kit. Includes all hardware and components needed to fit side rails to any 9 slat-long Front Runner Slimline II Roof Rack. Add expedition style side rails to the Front Runner Slimline II Roof Rack at any time. This side rail kit allows the front and back of the rack to remain open for loading larger items onto the Slimline II Roof Rack (eg. Canoe/Kayak, Surf Board, Lumber) or for mounting certain accessories at the edge of the rack, like the Front Runner Double Jerry Can Holder. 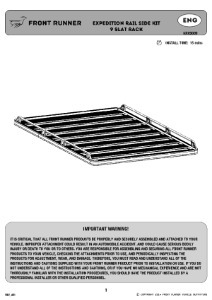 Please Note: This kit only works with 9 Slat-long Front Runner Slimline II Roof Racks.